Lilac Grove ~ Paper Sculptress: Good News!! Guess what?! As of last weekend, if you are in TO or Greater Toronto, you can now see my art in person at the Leslieville location (1114 Queen Street East) of the Arts Market!! 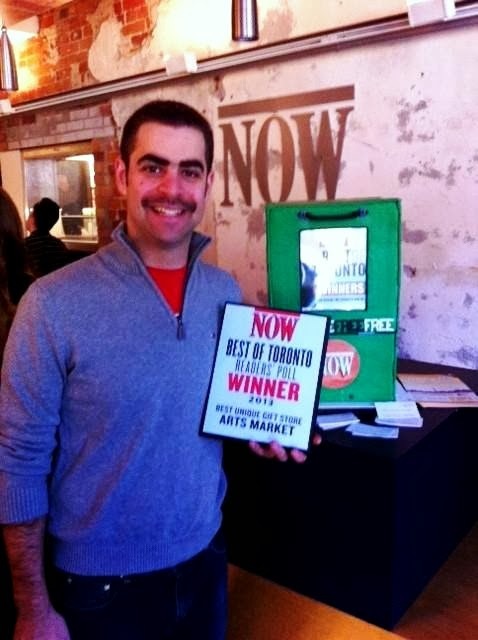 And more good news: the Arts Market recently had a win in the "Best of Toronto" issue of NOW magazine! Chances are that you will run into the Arts Market coordinator, Daniel Cohen, (see photo and announcement below). Thanks to Daniel for giving me this opportunity to be a part of the artisan community at the market!! "The Arts Market is VERY excited to announce that we won NOW Magazine's BEST UNIQUE GIFT STORE in Toronto. This really means so much to the Arts Market and all of its vendors, so big thanks to everyone who voted for us! Here's Market Coordinator, Daniel Cohen, collecting our prize at the awards breakfast this morning (it's Movember by the way.)"